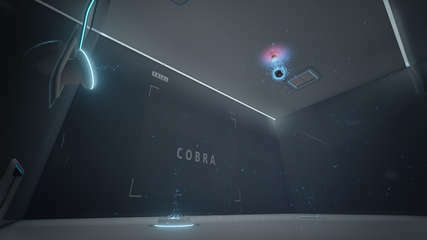 Using a combination of your Test Suit abilities, interact with and manipulate trial elements to reach the goal door. Refine your skills and earn ranks based on time then post times against your friends on the integrated Steam Leaderboards. The Jump Jets are your main source for navigation. With a short cooldown and subtle directional response, time them correctly for the best approach, adjustments, and angle. When you hit an Orb with your Tether Shot, it will yank you in its direction. Be accurate and precise, your position when linked will make all the difference. Your gun takes a few to recharge, so try not to miss. Your Remote will activate receivers which, in turn, manipulate an element within the trial. Launch an orb, open a ledge, and unlock a door just to name a few. Don't forget, you're usually flying through the air. If you've been longing for a game that really pushes you for success and the glorious feeling of self accomplishment, then APT will be right up your alley. Earn ranks based on your trial times-- go for the diamond!! If that isn't enough, race the clock and post against your friends on the integrated Steam Leaderboards. Intuitive and responsive movement and controls. Use the abilities of your suit and interact with elements in each level. Earn ranks based on your trial times.